The Rev. Eric Huffman, pastor of The Story in Houston, podcaster behind MaybeGodPod.com, and author of 40 Days of Doubt. I admit I was a skeptic about 40 Days of Doubt. When I first came across the slim devotional volume by the Rev. Eric Huffman, I brought several not unreasonable opinions with me: that most devotion books have the substance of a light after-dinner mint; that most writing on doubt and faith leans either towards self-centered reflection on personal feelings and “speaking your truth,” or else simply load individually selected Bible verses into rhetorical weaponry to blast indiscriminately at honest questions; and that most books like this have a youth pastor buddy vibe, attempting to jocularly engage with young people in semi-desperate tones. Thankfully, this book is none of that. Certainly, daily reflections are kept short – but they don’t lack substance. Doubt and faith are addressed – but they are handled with careful theological and philosophical reflection. The author weaves nimbly among sources and references from Malcolm Gladwell to The Bachelor, but never with the air of someone laboring to show he “gets” it. A quick glance hooked me, and before long, I was a believer. This little book from Abingdon has the makings of a classic. And right now, it is urgently needed, as much as intellectual honesty always is. Somehow, Huffman manages to distill substantive reflection on theological philosophy – or philosophical theology – into wry sketches that often as not had me bursting into laughter at the cheeky tone of someone who knows when to take serious things seriously and that frequently, what we take too seriously is ourselves. The author demonstrates the rare ability to straightforwardly tackle questions like the problem of evil, the reliability of scripture, Christianity among world religions, faith and science, hypocrisy and witness, and the existence of God without sidestepping or appealing too quickly to mystery or blind faith. And this brings us to a dynamic that we must pause and address. Bringing up questions and doubts about faith does not endanger faith. Sometimes, there has been a tendency to avoid difficult conversations, or to ignore them and hope they won’t occur. Perhaps we think that bringing it up legitimizes doubt, or introduces it where it wasn’t before; perhaps our discomfort with the answers we were given surfaces, and we lack confidence in our ability to give any better answers to those who ask us. Sometimes we simply haven’t heard some of these topics preached about well, if at all. No, bringing up questions and doubts about faith does not endanger fragile faith; but answering them poorly might – something thinkers like G.K. Chesterton, Madeleine L’Engle, and C.S. Lewis knew (and all of whom are quoted in various places throughout the book). Thankfully, in an era when the death toll rings for nuance, it is apparent that it’s not quite dead yet. The author’s own background helps illustrate the subtle thread running throughout his discourse – that he has no agenda but the Truth – biblical truth, handled and shared across centuries by Christians offering their intellects to God without sacrificing sanctified imagination. Now a fourth generation United Methodist pastor, for a while Huffman was an atheist, persuaded by the arguments of a professor. 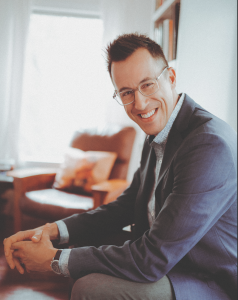 “During my first ten years as a pastor, I believed the Resurrection was an allegory,” confesses Huffman. “What mattered wasn’t that Jesus actually rose; it was that His followers – the church – rose up in the wake of His death. It wasn’t important to me whether Jesus’s tomb was literally empty; His philosophy and His community were enough for me. His intellectual quest, from the faith of his family to atheism, from a Jesus Seminar perspective on Christ to the historic orthodoxy of St. Athanasius or Chesterton, allows him to navigate around partisan culture wars and ideological food fights, to what Lewis sketched out as “mere” Christianity. Where he does extrapolate theologically, he does so from the rich biblical tradition hammered out by many over centuries, with thoughtful scholarship winsomely communicated and easily grasped. One of the hardest things to do as a writer is to boil down essentials of a claim or argument and make them simply understood by the average fourth grader. Repeatedly, he somehow does this in a daily devotional style that means ten or fifteen minutes’ worth of reading can help clear away decades of bad theology poorly understood and confusingly communicated. “I think one of the worst lies we’ve ever been told is that we’re all supposed to be happy. Advertisers tell you that lie, and social media does, too. Here is where Huffman beckons us: to a mature faith. It turns out that the same reasoning that unfolds a path to Christian faith is the same reasoning that shapes a mature Christian faith. The wide arc flown around theism matches the curve of the smaller flight path circling around Christianity, and the tightening shape gains rotational velocity the closer and closer we approach to Christ, like a funnel donation container kids beg to slide a quarter into, watching the coin spiral ever tighter to the center. Everyone needs to be reminded sometimes of what we believe, and why we believe it; of subtle forces that have shaped our beliefs in ways contrary to scripture and the wide-stretching communion of saints; of the beauty that contours what we confess and why we confess it. For confirmands, for graduates, for tired, aged saints; for busy parents who never took a seminary philosophy of religion class, for burned skeptics, for those deconstructing their faith; for pastors, for veterinarians, for bartenders and bishops – this book is for you. 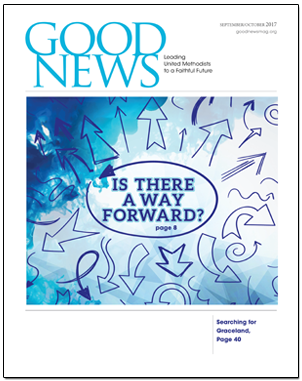 Elizabeth Glass Turner is a frequent contributor to Good News. She is the editor of the WesleyanAccent.com. 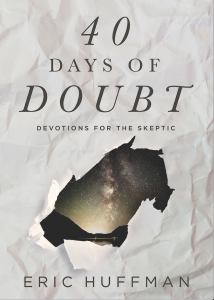 You can purchase 40 Days of Doubt here.